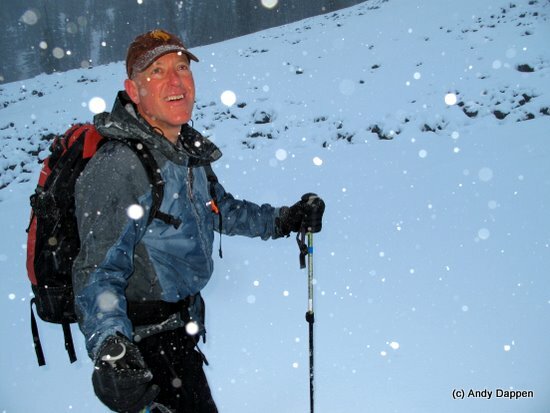 Three strides above the Mission Ridge parking lot Tom Janisch is surprised by what he’s finding, “The snow has gone from Eastside powder to Westside glop overnight.” The atmosphere has taken a Westside turn for the worse as well. Drizzle spits on our parkas. For those of us accustomed to skiing the colder East slopes of the Cascades, this is an inauspicious first day of a new decade. Were the snow soft and skies beautiful, I would place deep meaning on what that might portend for the year and the decade ahead. Instead, I try to block out what this wet, sloppy weather symbolizes (prepare to get pissed on, or welcome to 10 years of foggy wanderings) and lean on pragmatism for an explanation (if you ski a lot, a few days will be marginal). Tom is smiling. As usual, he’s game for whatever. I, on the other hand, am hoping this will prove to be a persistence-pays-off experiences where you reap better conditions by day’s end than you expected at day’s beginning. 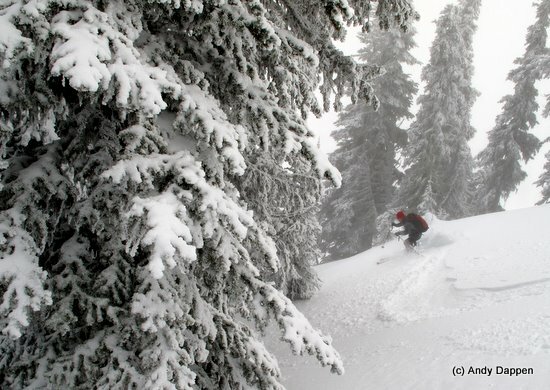 We climb into the fog, obeying Mission Ridge’s uphill policy and staying well left of the ski area’s groomed runs. Mission Ridge apparently forgot about the changing of the decade eight hours ago and is making up for that now—every five minutes they detonate a bomb in the bowls to our right whose shock waves are felt underfoot. 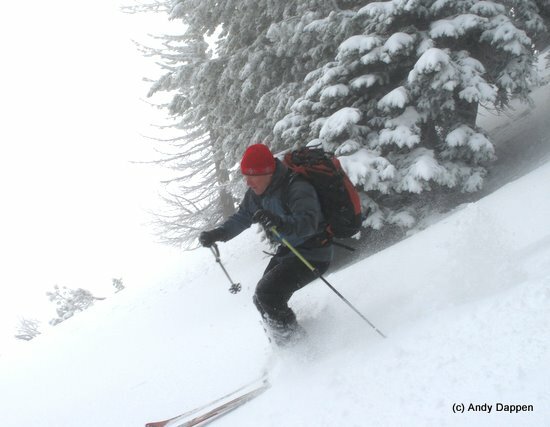 In near whiteout conditions and in what could be a Pakistani war zone, we shuffle upward. Gradually we move out of tropical air sandwiched between layers of colder air and the water pelting us becomes a confetti of ice pellets. Nearly two thousand feet above the parking lot, we wander through forests with nicely spaced trees and a carpet of heavy powder. With what may be the Year of Rain ahead of us, we opt to grab gifts when they are offered. We strip the skins and take a short detour downward. Over the course of ten minutes my mood about the New Year takes an optimistic bend. We re-skin, pass our previous high point, and soon have a decision to make. Should we ski west to the ski area and spend the afternoon on groomers where we know we won’t stone grind our bases in the shallow snowpack, or should we ski east to the Stemilt Basin whose snowpack could be thin and slabby? I ask Tom what he’s game for and, as expected, we’re soon striding toward the Stemilt. Never give Tom a choice if you actually want the short option. Twenty minutes later we’re peering through chowder weather at the open slopes where the Mission Ridge Ski Area was almost built over 40 years ago. Those slopes disappear into the soup below us. These days the basin is visited by as many snowmobilers looking for places to highmark as skiers looking for downhill turns, but on this low-snow winter the lower access roads are apparently in poor shape — not a single machine has molested the bowl before us. We assess the upper slopes and like what we find. Over the next few hours we take two laps down our own private ski area. Five inches of new snow can’t be called ‘deep’ and the snow’s consistency is Cascadian flour rather than Utah fluff, but the stuff carves easily and smoothly. It’s the best snow Tom and I have enjoyed in a month. In early afternoon, we quit this New Year’s game that Tom is calling the Stemilt Bowl (a reference to the Rose Bowl, you know). We ski out of the basin and tour west to Mission Ridge where Tom will rendezvous with his family for some downhill turns. On the ridge capping some of the resort’s hike-to terrain, we strip the skins. “We just need a sun break now,” I tell Tom, “to make this day the poster-child of the rewards of perseverance.” Tom doesn’t really relate–other than death or paralysis, everything is ‘funola’ to the mutant. The skins are in the pack and we’re buckling boots when the sky brightens. 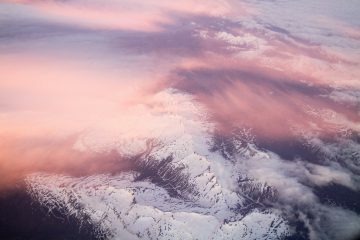 A white ball burns through the shrouds above us while, down below, the Red Sea of clouds splits wide open. Suddenly the symbolism I was afraid to evoke earlier runs amuck. We stand like Moses looking down a ribbon of untouched snow that leads us away from the windy ridge of the pharaohs to the Promised Land. Obviously it’s a ridiculous analogy … the ribbon doesn’t lead to the Land of Milk and Honey, it is itself the Promised Land. 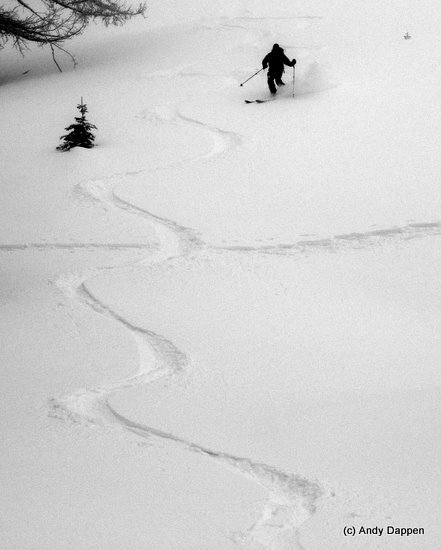 We drop in and taste what is, so far, the best run of the year. Activities. Skiing and snowshoeing. 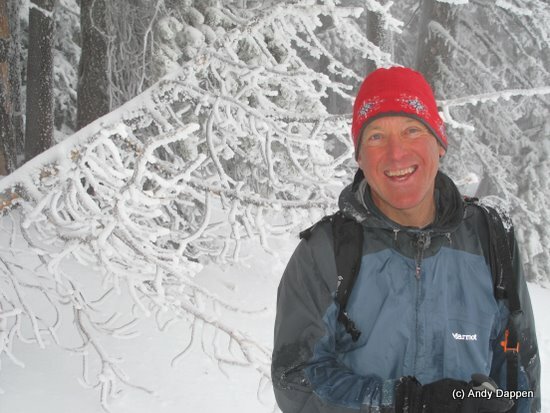 This post is written with a skiing emphasis but the same route is a good snowshoe tour. Skill Level: 2 or intermediate. 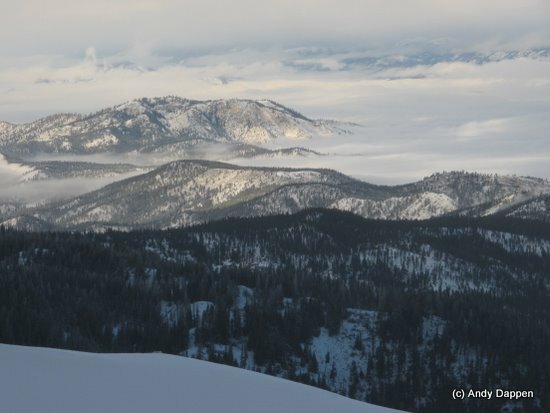 There are advanced lines you can ski in the Stemilt Basin but this tour is well suited to intermediate skiers. Fitness: 2 or intermediate. 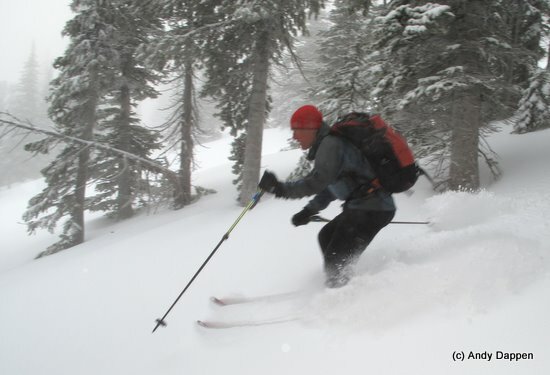 Stronger skiers can make more laps in the Stemilt Basin. Elevation Gain: It’s a 2,000 vertical foot gain from the parking area to the top of the Stemilt Basin. Different laps in the Basin will add 1,000 to 1,500 vertical feet of climbing to the total. Best Seasons. Early winter for powder (and before snowmobiles have easy access to the area) and late season for corn (and after snowmobiles stop visiting the area). Map. 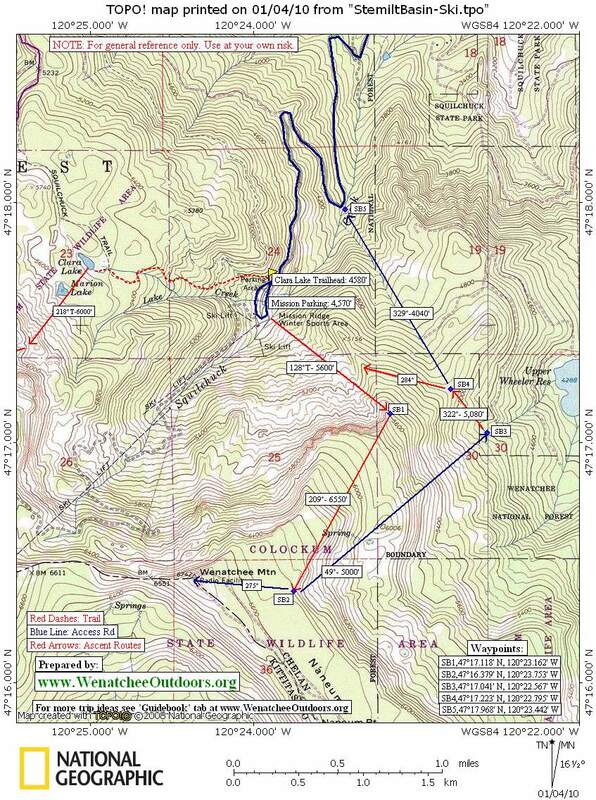 See our topo map below. Note: Use ‘Print Preview’ to orient/scale the map before printing. Access. Drive 12 miles above Wenatchee on the Squilchuck Road to the Mission Ridge ski area and park near the entrance of the parking lot (farthest away from the lifts). No permits are needed to park. Trip Instructions. Walk to the front, left edge of the parking lot (by the RV parking). Climb uphill of the resort staying off and left of any groomed runs. At the very start it’s sometimes easiest to shoulder the skis and boot uphill through a steep section of trees for a few hundred vertical feet. Follow a true bearing of 128 degrees to 5,600 feet; then a true bearing of 209 degrees to the lip of the Stemilt Basin. There are many lines of varied steepness to descend in the basin. There are various options for the return trip that are snow depth and avalanche dependent. In low-snow conditions the favored option is to climb out of the basin and ski to Mission Ridge where there will be better coverage on the downhill slopes leading back to the parking lot. When there’s ample snow, try one of the two options on our map — one returns to the slopes you ascended, the second hits the Squilchuck Road at the 4,000 foot level. The second option has thicker trees to navigate but gonzo types who like bark in the teeth and branches in the face will find it a memorable adventure. Hazards. Stemilt Basin is avalanche prone. The area gets hammered by wind. Wind deposition and wind slabs contribute to the slide hazard. 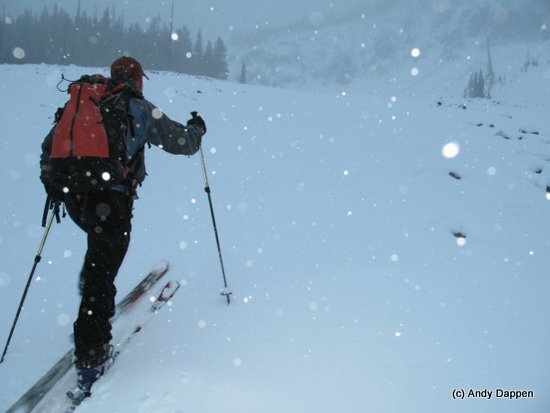 Know how to assess the hazard, carry appropriate avalanche gear, and only expose one skier at a time to potential slides as you descend/ascend hazardous pitches. Uphill Policy. 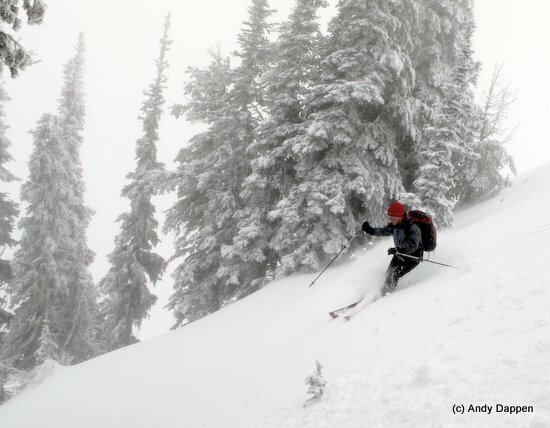 Mission Ridge has an uphill policy for backcountry skiers. If you’re unaware of that policy, or how and when backcountry skiers can use the resort, please read this article. Violating the policy creates safety concerns. It also strains relationships with the ski area. Snowmobiles. It’s not unusual for skiers to find good skiing in the Stemilt Basin, but this is also a snowmobile playground and sometimes the best ski lines have been high-marked. Many skiers are not fond of snowmobiles – especially when they’re off road and in our powder stashes — but they are allowed here and they’re out having fun too. 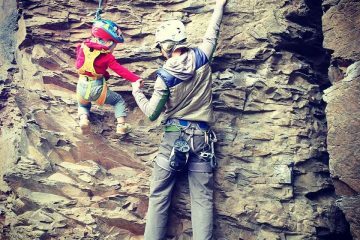 Attitude is very much practiced behavior and we recommend pleasant, civil interactions – you’ll have a better day and so will those who enjoy the outdoors in a different fashion. Land Ownership. The area is a checkerboard of Forest Service and state lands.